Like many people, I discovered Harry Nilsson's music later in life than I should have. I was in my early 30's when I really started to listen to Nilsson and was blown away by his voice and his song writing. He didn't have a "style." Some of his songs were funny and others were extremely sad. Add the Beatles connection into the mix and Harry Nilsson has quickly became one of my top favorite singers of all time. I was excited to read the book Nilsson: the Life of a singer-songwriter by Alyn Shipton because side from the Harry Nilsson documentary, I really didn't know much about his life. First I have to say that Shipton blew me away with the in-depth research he did for this book. He was able to interview many important people in Harry's life, and those he wasn't able to interview, he dug into archives and found other interviews those people had done. He was able to use parts of Harry's unpublished autobiography for writing the book as well. 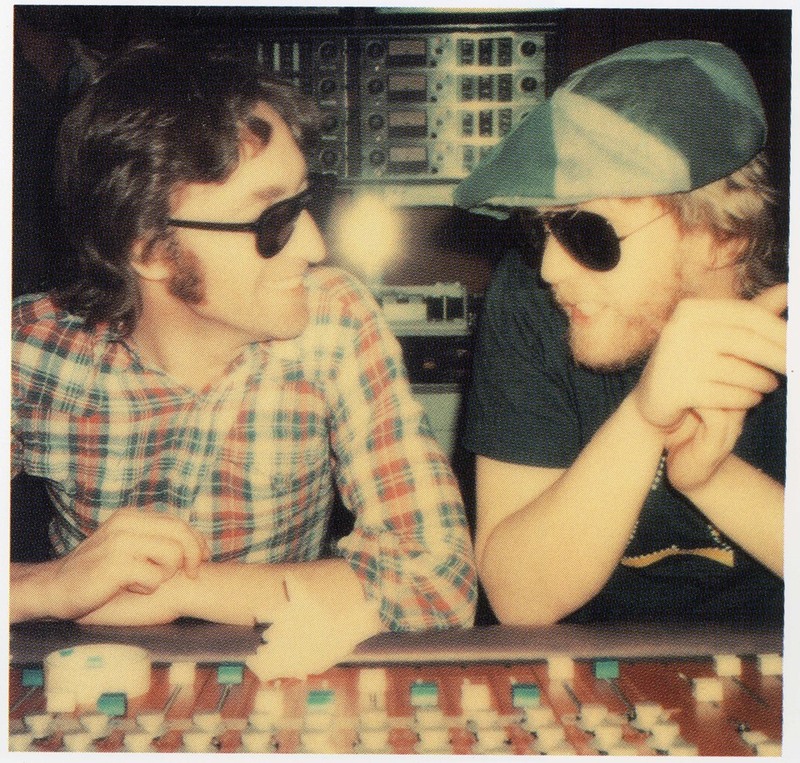 So I have to tip my hat off to Shipton for writing an extremely well documented book about Harry Nilsson. If anyone ever wanted to learn about Harry's life, this is the book to read. Being a Beatles fan, the Beatles information was the most interesting to me. There were many things that I didn't know or I had forgotten. I never realized that Harry was with Derek Taylor when he lost his way in the fog on his trip to visit George on Blue Jay Way in 1967. That was the first time Harry met one of the Beatles. 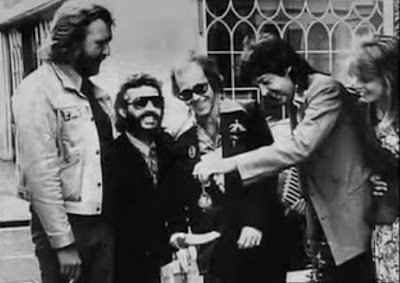 I guess I didn't realize how much Paul and John saying at the 1968 Apple press conference that their favorite group is "Harry Nilsson" really boosted Harry's career and things took off after that. I liked reading about when Harry went to London shortly after that and met with Paul and spent time with John at Kenwood. A big part of the book talked about the "Lost Weekend." There were some stories that were new to me about Harry and John. However, I did not like how some people in the book were blaming John for being a bad influence on Harry. They made it sound like Harry's career went downhill after working with John because he ruined Harry's voice. However, Harry himself had sad that his voice wasn't the same before the Lost Weekend. And I think both John and Harry were equally to blame for the mischief that occurred during that time. Trying to make John Lennon out to be the "bad guy" didn't sit well with me. However, the book did really show how John got RCA to extend Harry's contract with them and Harry got a lot of money thanks to John. Harry was forever grateful to John for what he did at RCA for him. The other Beatle friendship is of course the one he had with Ringo Starr. I was disappointed that the book didn't say how the two best buddies first met. When Harry went to London in 1968 and met with Paul, John and George, Ringo was in Spain. So when did Harry finally get to meet Ringo? Did they hit it off right away like it was with John? 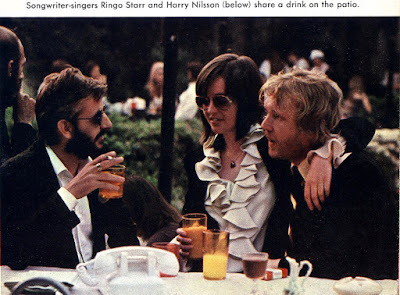 I didn't realize how often Ringo and Harry worked together musically. I guess I always just thought of them as best friends and drinking pals, but not much more. I think this book really showed what a great friendship these two had. I think that Ringo saw the Beatles as his brothers and Harry as his best friend. 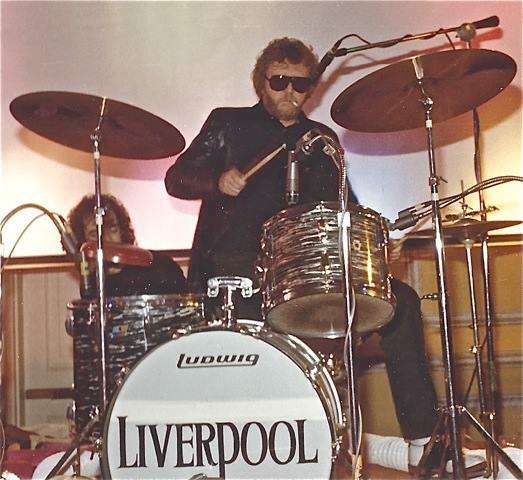 What really touched me is that when Harry had a big financial hardship late in his life, Ringo stepped up and bought the Nilsson family a house and gave them a sum of money to make ends meet. If that isn't a sign of true friendship, I dont' know what is. The book was boring at some spots. It went into detail about each and every producer Harry had on each album. Every session player. Details about every song. Some of the songs I am not familiar with and so I had no reference and I ended up skimming over some of those parts of the book. And while it is a very minor complaint, the author got the information about Beatlefest and Harry sort of mixed up. I think he should have interviewed Mark Lapidos or the guys in Liverpool to get more information about Harry's performances at the Fest, as these were the few live performances Harry ever gave. Overall, I really did like the book and I came away with it realizing that Harry Nilsson was a man with a lot of passion. He had passion for his song writing and his music, he had passion for the musicals he produced, he had passion for his family, he had passion for making his friends happy and he certainly had passion for ending handgun violence and death. Harry had his demons and his faults, but in the end, you can see that he was a man with a huge heart along with a great voice. You can get this book like I did---it is on Amazon! PS oh my gosh, is that a picture of Nilsson with Paul and Linda, plus Elton John and Ringo????!!! !